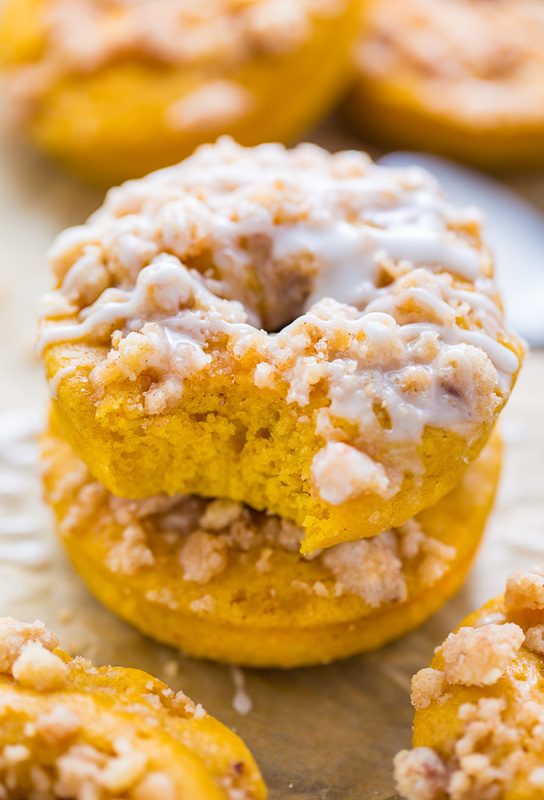 Pumpkin Coffee Cake Donuts are the ultimate Fall treat! Baked, not fried, and ready in less than 30 minutes. 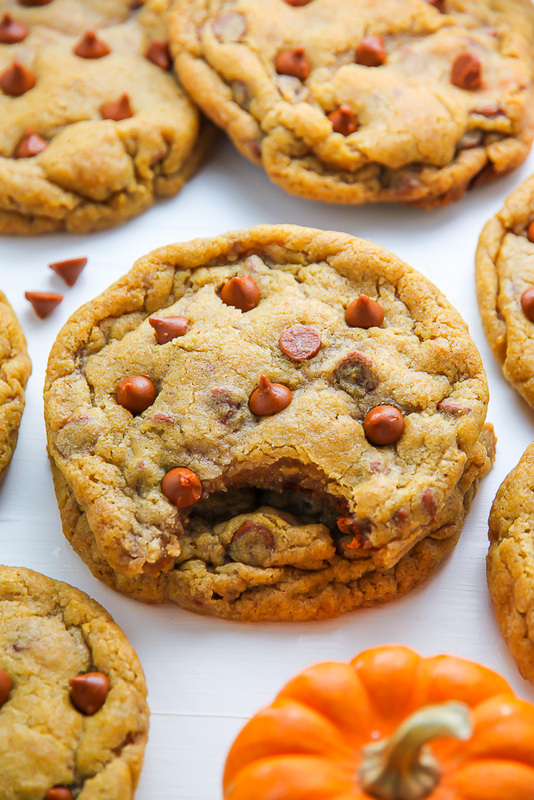 Fall is right around the corner, my friend… and you know what that means: PUMPKIN! I have a few really amazing pumpkin recipes coming to you this week (including those pumpkin oatmeal chocolate chip cookies I teased you with on instagram), but first, DONUTS! 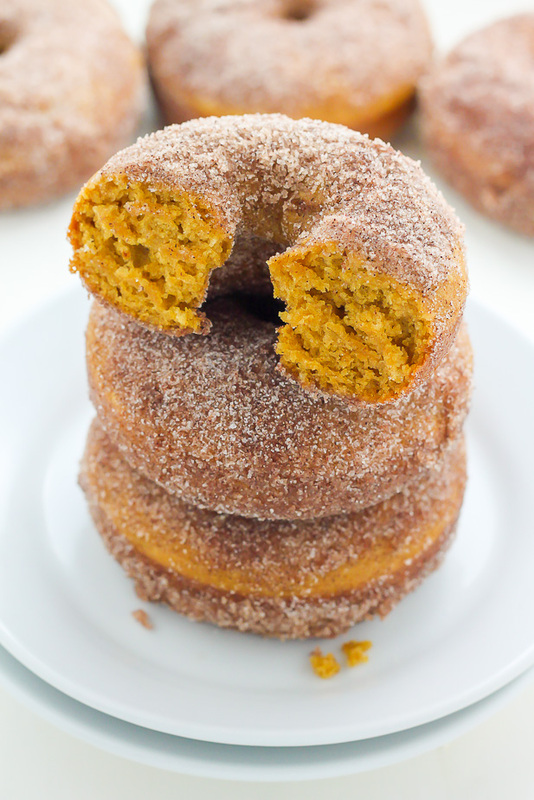 Pumpkin Coffee Cake Donuts with PUMPKIN SPICE glaze, to be exact. I think a double batch is the perfect only way to welcome this September weekend. 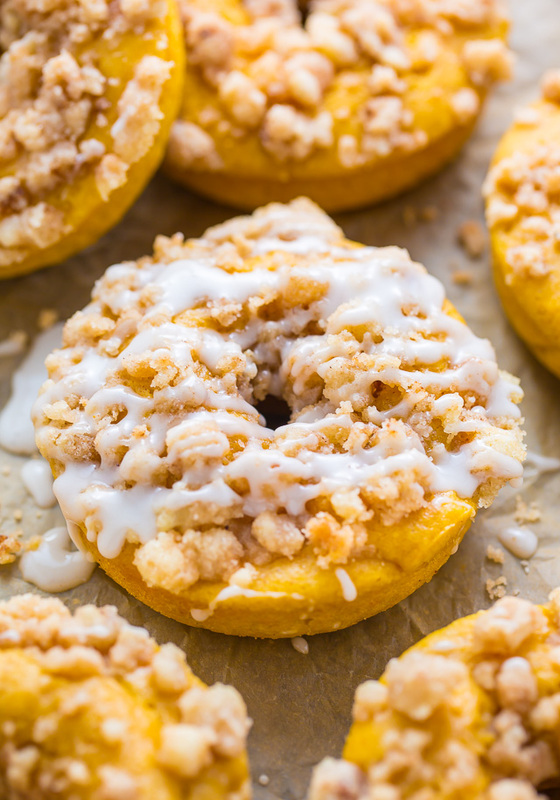 There are 3 parts to these pumpkin coffee cake donuts: the buttery crumb topping, the baked pumpkin donut base, and the pumpkin spice glaze. But don’t let that scare you off! Each step in seriously simple and should take no more than 5 minutes to complete. 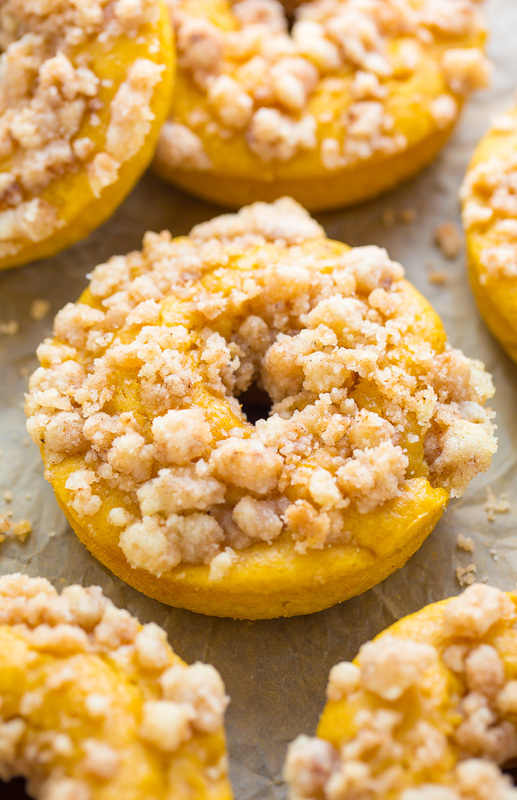 You’ll want to make the crumb topping first so it has time to chill in the freezer while you prepare the donut batter. It doesn’t need to chill long, 5 to 10 minutes is plenty! 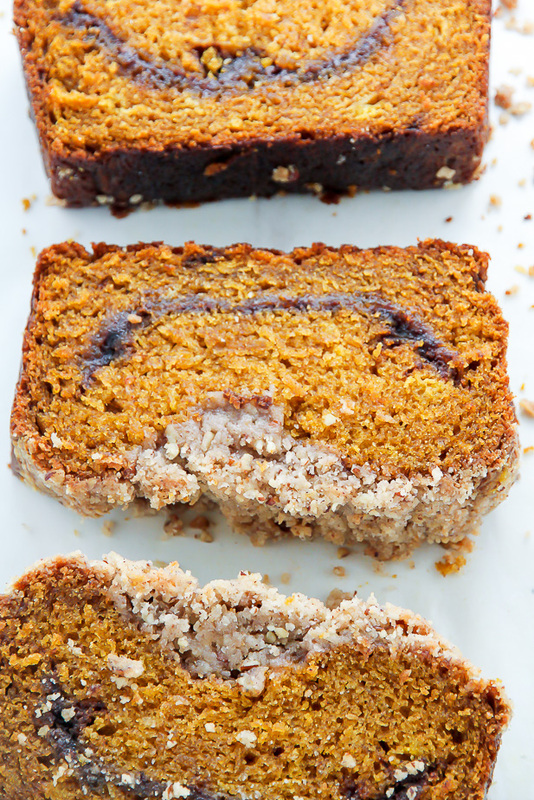 Chilling the crumbs in the freezer helps them melt more slowly during the baking process. 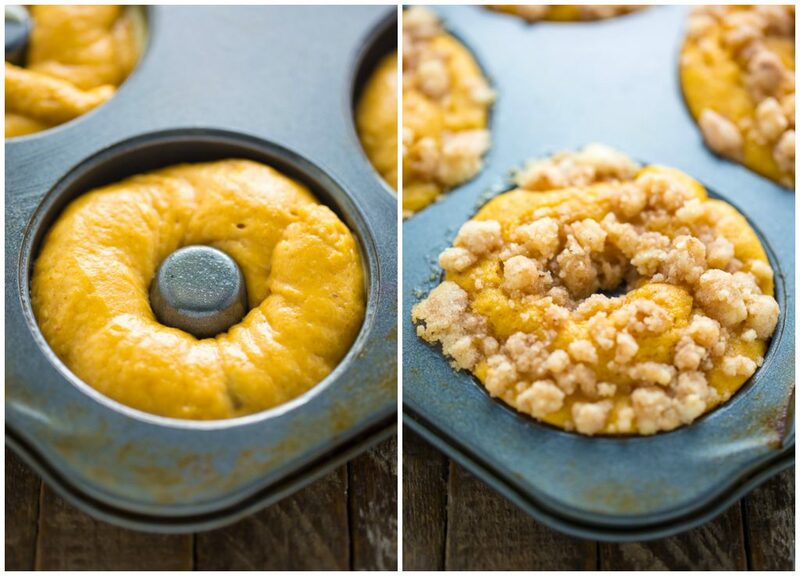 A donut pan is required for this recipe. If you don’t already own one, feel free to click here and check out the amazing (and affordable) pan I’ve been using for the past 5 years! Be sure to generously grease your donut pan with butter and flour or non-stick spray. If you’re using spray, I suggest using one that is made specifically for baking, since they typically have flour in them, which helps the donuts come out of the mold easily. You’re going to want to grease every little nook and cranny. The pumpkin donut batter will be thick, so you can be spoon it into the donut pan, or you can pour it into a ziplock baggie, snip off one end, and pipe it into the molds. Most importantly, be sure you don’t over bake your donuts! Over baked donuts come out of the oven tough and dense, not moist and fluffy as they should be. Set a timer for 10 minutes and keep an eye on them. Once they’ve risen and slightly spring back when touched, they’re ready to come out of the oven. The donuts will be very delicate when you first pull them out of the oven. Let them cool in the pan for 10 FULL minutes before gently lifting them out of the molds and transferring them onto a cooling rack. To prevent the donuts from becoming soggy, I suggest adding the glaze right before serving them. These donuts are best served the day they are made. Pumpkin Coffee Cake Donuts! Baked, not fried, and ready in less 30 minutes. Preheat oven to 350 degrees (F). Spray a 6 mold donut pan with non-stick baking spray; set aside. In a small bowl combine the sugar, flour, and pumpkin spice. Add in the melted butter and use a fork to stir it into a coarse meal. Chill the topping in the freezer while making the donut batter. In a large bowl combine the flour, brown sugar, salt, baking powder, and pumpkin spice; mix well, making sure any large clumps of brown sugar gets broken up; set aside. In a separate bowl whisk together the pumpkin puree, melted butter, and milk. Gently fold the wet mixture into the dry mixture - don't over mix! Spoon or pipe the mixture into prepared doughnut pan. 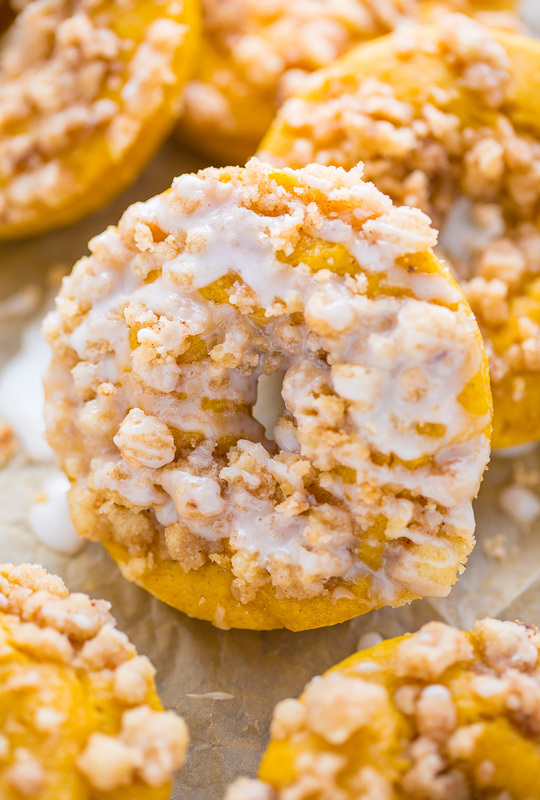 Divide crumb topping evenly among donut tops, then bake for 10-11 minutes, or until the doughnuts spring back when lightly pressed. Allow doughnuts to cool for 10 minutes in the pan before gently lifting them out and transferring to a wire wrack to cool for a few more minutes. In a small bowl whisk together the confectioners' sugar, milk, vanilla, and pumpkin spice. Drizzle over donuts and serve at once. These look so good! I use similar ingredients to make a pumpkin cake so I know these will be good. I just pinned for future use! Thanks!! Wow! I don’t even know how I found your blog. I was googling recipes the other night, and I stumbled upon these donuts. 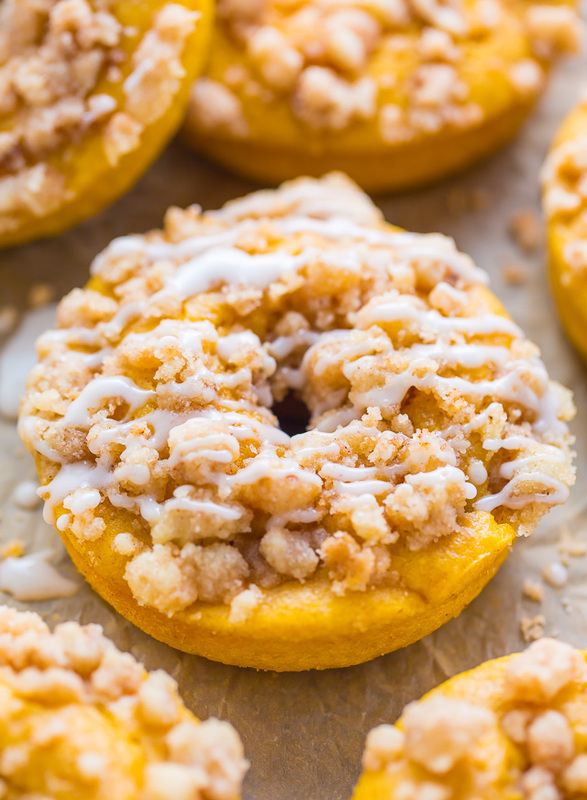 My sons are on a gluten-free, dairy-free diet currently, so I just made those changes to this recipe, but these donuts still came out fantastic! Yay! Since I am nursing, I have to do the diet, also, and I was having a big-time donut craving. I am so glad these fit the bill. Thank you so much, and I will continue to stalk your archives for further ideas! Wow! I just made these and they are absolutely amazing! My husband is already finishing his second one. I can always count on Baker by Nature to come up with, tasty recipes. P.S. I noticed that the glaze on your photo is white while mine turned out more of a light brown. Is that because you used to clear vanilla? Also, it was rather thick so I ended up adding a bit more milk which did the trick.